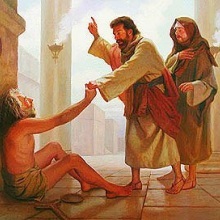 Peter took him by the hand and immediately he received strength in his ankles and feet. He leaped up and began walking, and leaping and praising God. Naturally people who were there and who heard about it were greatly amazed, and looked intently on Peter and John. What happened next is very instructive. People tend to associate God's healing with their own godliness. Some use healing to promote themselves in the eyes of people as trying to make out that they have some special power from God. There are those "healers" who desperately want everyone to know that God has given them this kind of power or gift. They make a pretty decent living playing on this idea. Peter made it plain that this man's healing was not about him. Peter wasn't seeking an audience. Peter simply did what God led him to do because of Peter's faith that God would do it. Peter makes several important points. 1) It is through Jesus Christ and faith in His name that we are healed. 2) He disclaimed any thing that came from him except his faith. Peter took the opportunity to make a third and fourth great point. Healing, again, wasn't for the glorification of the people through whom God inspired the words or the prayer for healing. It was to turn people to God through Jesus Christ and believe that He was the one through whom sins are forgiven. This is a hard lesson for all of us. God is creating a people for Himself - people who have faith in Him, people who consider Him as the great Chief Shepherd. He tells us to work under Him to shepherd the flock which is among you, serving as overseers, not by compulsion, but willingly, not for dishonest gain, but eagerly. Any healing we experience or any healing we seek must be from Him based on our own faith. Christ frequently referred to the faith of those who came to Him for healing. It was not faith in a person, but faith in Christ. The elder, himself, must give a prayer of faith, as one would expect. But God is the one who will have the credit, praise and honour for what He does according to His own will and power. The greater miracle is when a person repents and turns to God. There is a crisis of faith. Few people place confidence in God or the future. Many have no faith their marriages will survive, that political leaders will honourably serve their country or that education will prepare them adequately for the challenges ahead. Faith is all too rare today. This booklet will help you understand the keys to living faith. Are you desiring a closer relationship with God? If so, where do you start? What tools can you use to grow spiritually and build that all-important relationship with your Creator? This important study aid will set you on the right path. Read and begin implementing these important elements today! Why did God command a day of rest? Is the Sabbath relevant today? Why confusion about one of the 10 Commandments? Why are Christian holidays observed with so many non-Biblical rituals? Discover why! Learn God's astounding plan for every man, woman, and child who has ever lived. This booklet explains the incredible truth about what lies ahead for all humanity. Many believers celebrate Easter as a way to honour Jesus Christ's resurrection. But Easter's roots stretch long ago into pre-Christian paganism. The Bible alone shows a different set of celebrations—the Passover and Days of Unleavened Bread—that give us the story Easter doesn't.